(CNN) -- Tiger Woods returns to competitive golf in Arizona on Wednesday with a smile on his face and saying he is 100 percent ready and feeling stronger than ever after eight months on the sidelines. Woods is clearly enjoying himself as he lands a ball on the green from a bunker during his Match Play warm-up. World number one Woods faces Australian outsider Brendan Jones in the first round at the WGC-Accenture Match Play Championship -- his first tournament since beating the pain barrier to win the US Open last June. The 33-year-old needed reconstructive surgery on a ruptured anterior cruciate ligament (ACL) in his left knee following his triumph at Torrey Pines where he also finished with a double stress fracture of his left tibia. 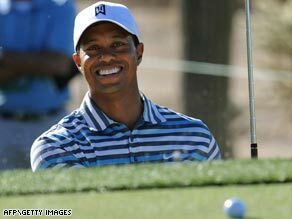 "It's great to be back," 14-time major winner Woods said after completing a practice round at the Ritz-Carlton Golf Club. "I feel a lot stronger in my left leg. Both legs have been stronger than they ever have been. "Stability is something I haven't had in years. So it's nice to make a swing and not have my bones move. "Since I had a lack of ACL for a number of years, no matter what I did, it was always moving. "So I would try and hit into my left side, but the more I did it, the more it would move, hence one of the reasons why you saw me jumping off the ball. It's nice to be able to hit into it for the first time." The 33-year-old added: "As far as my golf swing, I'm doing the same things I've been trying to do, but now I have a leg I can do it on." Woods, the defending champion and three-time winner, said he was looking forward to getting back on the first tee, at 12:46pm local time. "I miss that rush of playing and competing, I really do, getting on that first tee and feeling it. I miss that," he said. "As much as you can have money games at home with the guys, it's not the same. "This is what I do for a living, and this is what I've always wanted to do my entire life, and not being able to do it at the highest level was frustrating at times. "It wasn't as frustrating as you might think because I knew I wasn't physically ready to do it. "As I said when I was at the Chevron World Challenge (last December), I didn't feel like I was ready to come out here and embarrass myself, and I had to make sure that I felt my game was good enough and ready to compete and win again. "That's what feels good about it, coming back out here and feeling that again." There had been one upside about being at home, he said, with his wife Elin, young daughter Sam and, for the past two weeks, with his newborn son Charlie. "It actually felt great to get away from it, be with Sam and E and watch her grow. I would have missed a lot of that. So I was able to be a part of that," he said.